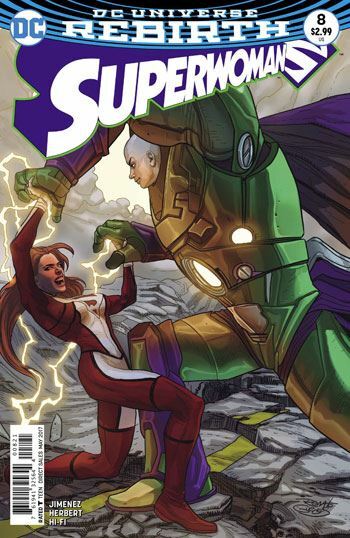 Superwoman #8 resolves the plot thread of the energy that has been empowering Lana Lang also being responsible for killing her. 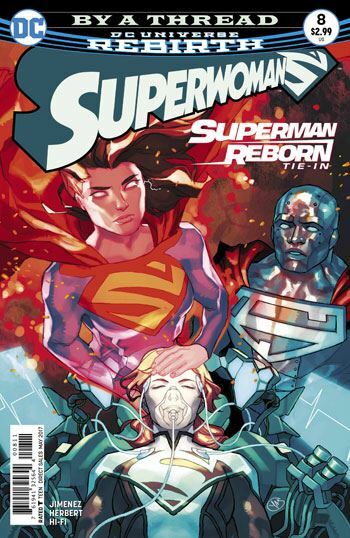 And it also ties in, to a degree, to events in Superman Reborn, and the larger Rebirth storyline. Perhaps that is why, although I enjoyed much of this tale, at the end I was left not quite understanding what happened. Most of the story takes place on the astral plane, as Lana Lang’s spirit converses with the ghosts of her dead parents and brother, as well as those of the New 52’s Lois Lane and Superman. Thankfully, Jimenez does make sense out of Lois’ ghostly appearances in the earlier issues of this series, and the resolution to all of that does make sense. I also enjoyed what little was done with Lana’s parents and brother, rounding out elements of her life that have never been explored before. I hope that, in issues to come, flashbacks will allow us to see more of these people, back when they were alive. A lot of the dialogue in the issue shows an awareness of the reality altering events taking place. Lana can sense that her life is part of a larger story, and to her dismay, she is not even central to it. The true story belongs to Superman and Lois Lane, and her life, and the lives of those she holds dear, are simply pebbles that get shifted by the waves of change that emanate from the core couple. The truth of that is blatant to any comic reader, so it is almost heart breakingly sad to see Lana realize it as well, and come to terms with her own degree of insignificance. But the issue is not all tear jerker stuff. I am very pleased to see that Atomic Skull and Bizaress show up, and the groundwork seems to be laid for the pair to continue as supporting characters as the book goes forward. It’s really only the final page that puzzles me. I am certain that at least part of my confusion is intentional, and I trust Jimenez to explain it all in time. So far this book has vastly exceeded my expectations, and I see no reason to think it will not continue to do so.